FDA Decision Signals New Competition For Some Of The Costliest Drugs : Shots - Health News Drugs made from proteins or antibodies are difficult for rival manufacturers to copy. The Food and Drug Administration just approved a copycat drug for cancer patients that shows it can be done. 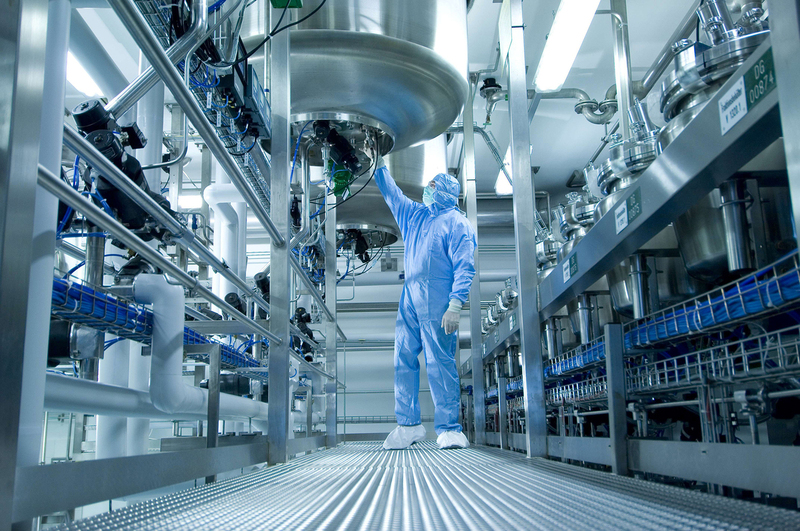 A look inside the factory in Kundl, Austria, where Sandoz, a unit of Novartis, makes biosimilar drugs. Mark McCamish spent more than five years preparing for a presentation he gave this winter. McCamish is in charge of biopharmaceutical drug development at the Sandoz division of Switzerland's Novartis. He and his colleagues made the case to a panel of 14 cancer specialists and a group of Food and Drug Administration regulators that a company drug codenamed EP2006 should be approved for sale in the U.S. The drug, brand name Zarxio, is similar to but not quite identical to Amgen's Neupogen, a medicine approved by the FDA back in 1991 to fight infections in cancer patients. Industry representatives, patient advocates and investors paid close attention to the evidence under review. Some came in for the day from Europe, their suitcases propped against the wall. That's because Novartis' drug application represented uncharted territory. Dr. Jay Siegel, chief biotechnology officer at Johnson & Johnson and a former FDA regulator, says biosimilars are a little like the generic drugs we're used to. The key difference is that they're copycats of more complex medicines called biologics, made with living cells. Think of it a little like drinks. If you want to copy the cocktail you had at your local bar, you buy the ingredients and faithfully follow the steps and proportions laid out in the bartender's recipe. Voila! A generic cocktail mixed more cheaply (probably) at home than at the bar itself — and just as good. Many biologics are approved for sale in the U.S. to treat conditions ranging from anemia to multiple sclerosis. The medicines make up a small but costly portion of the U.S. drug market. Amye Leong is a patient advocate who came in for the FDA hearing from California. Leong has rheumatoid arthritis. She was in a wheelchair for five years. No more, thanks in part to biologics. But she says it's important to approve biosimilars because biologics are so expensive that they're often out of reach for patients. "Now you want to pay rent food, get child through school or do you want the drug that will hopefully make a difference in your disease and life, it should not have to be about that," she says. The copycat drugs have been on the market in Europe for nearly a decade and led to a 20 to 30 percent reduction in some prices for some biologics. An estimate from Express Scripts, a drug benefit manager, projects Zarxio alone could save the health system nearly $6 billion over the next decade. But while Europe passed a law establishing an approval pathway for biosimilars a decade ago, that didn't happen in the U.S. until the Affordable Care Act took effect. Specifically, there's a 40-page section called the Biologics Price Competition and Innovation Act. Like the Hatch-Waxman Act which paved the way for generics in the '80s, this law established the framework for the FDA to assess and approve biosimilars. The legislation "was anticipated to save money," says Gillian Woolette, a consultant at Avalere Health who attended the meeting. "So therefore, if you put it in the Affordable Care Act, both the timing was right but also the CBO estimate was a savings of $14 billion [over the next 10 years]," which helped offset other costs in the health law. Other estimates put the savings even higher. Everyone at the meeting knew cost is a huge issue, but the FDA panel's task was to examine whether this drug is similar enough to the original one to be given to patients. It's a higher standard than is required for traditional generics and requires makers of biosimilars to submit some clinical data. After a brief, anticlimactic back and forth, all 14 advisors recommended that the FDA approve the drug, which it did last week. This story is part of a reporting partnership with NPR, WHYY and Kaiser Health News.